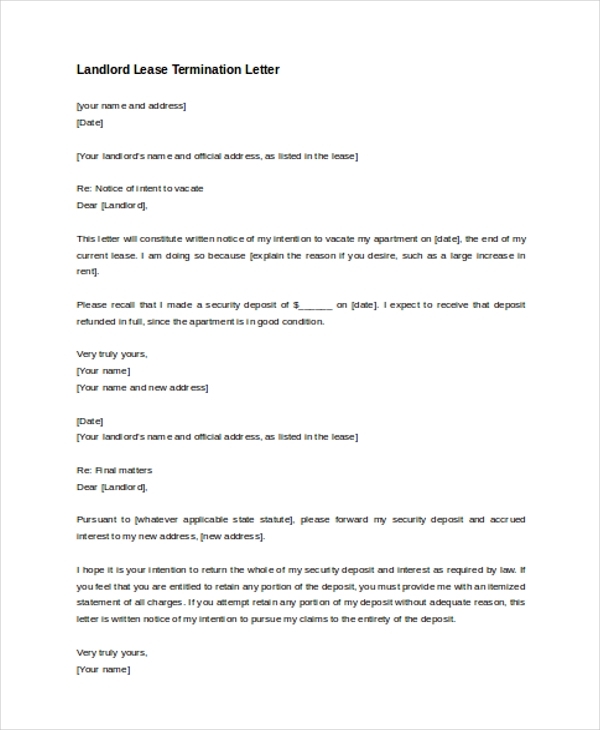 Landlord lease termination letter is written to the landlord to inform that you are leaving his or her apartment or premise and moving to a new place. 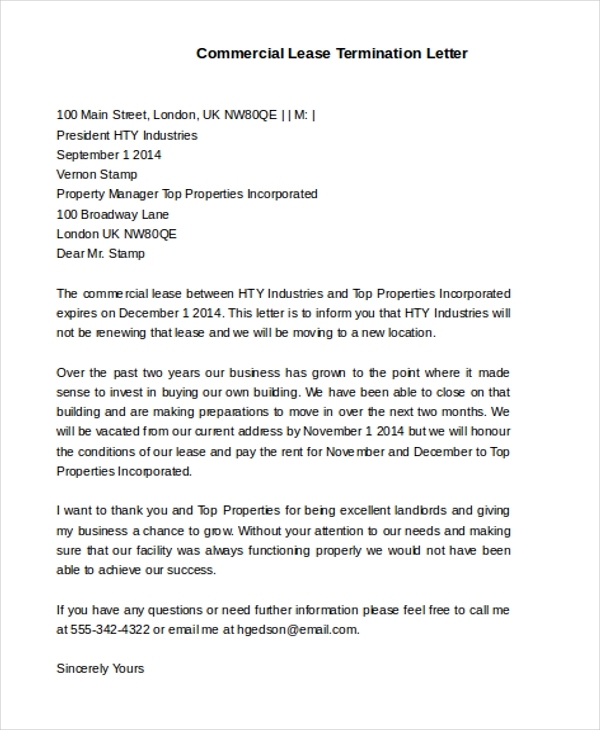 This letter acts as a prior notification for the landlord to arrange parties who can take up the premises. You may also See Termination Letters. The sample lease termination letter shows the format to be followed when writing a lease termination letter. The letter should follow sender’s address, date, receiver’s address, subject, salutation, body of the letter containing information on when you are leaving and if you have any person to replace you in that premise and then gratitude and signature. The lease termination letter from landlord to the tenant is written to inform the tenant that the period specified in the lease agreement has been over or terminated. 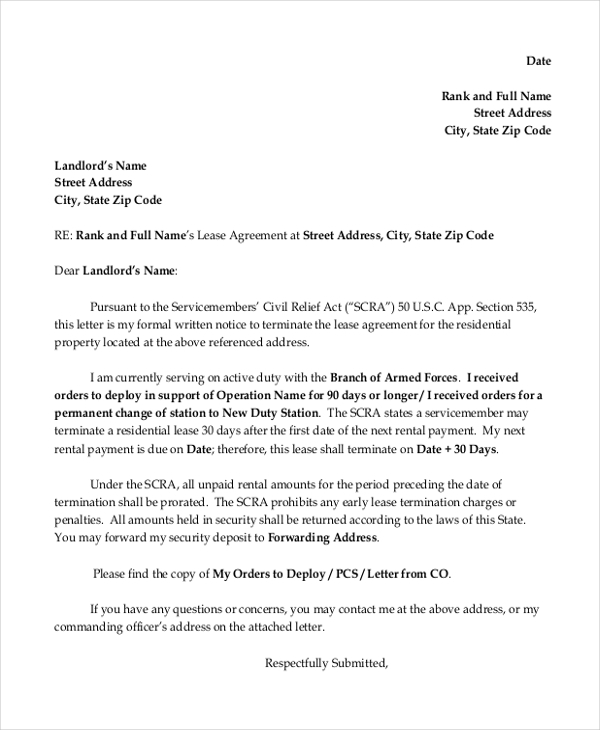 By writing this letter the landlord is trying to get information whether the tenant would renew or he should find a new tenant. You can also see Sample Reference Letters. Commercial lease termination letter is written when the lease period of any agreed premises or buildings given for commercial purposes comes to an end. The purpose of this letter is to inform the owner or take a step to renew. 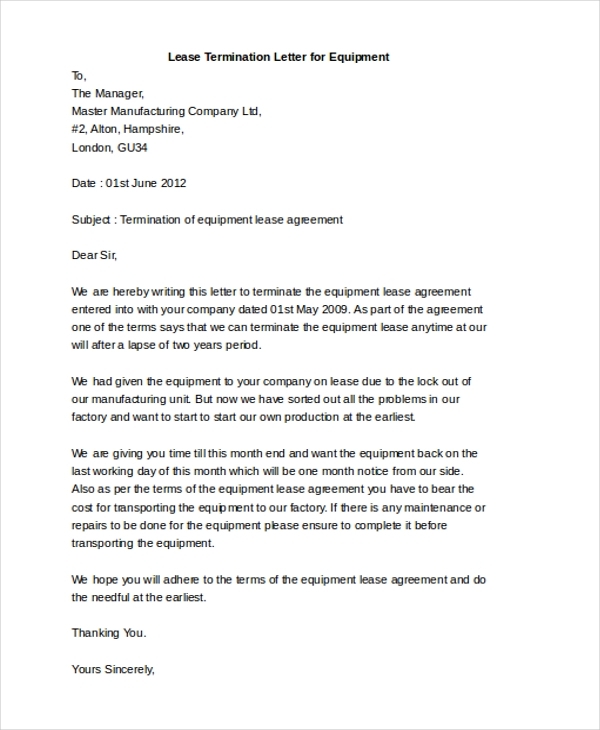 Lease termination letter for equipment is written to inform the organization or the owner of the equipment that the lease agreement period for the equipment has come to an end. You can also see Sample Resignation Letters. Letter of termination of the residential lease is written to inform the landlord or the owner of residential areas, apartments or houses that the lease term has come to an end and request them formally to accept new offers. Lease termination letter is written to the apartment owners to inform the lease agreement for the stay in the apartment has come to an end. Also, the letter is an indication to settle any dues or repair payments. The audience or people targeted for writing the lease termination letter are landlords, owners or people involving in the business of renting lands, houses, apartments, equipment or parts of equipment, office premises or any other commercial products. The targeted people can make decisions on various issues regarding the leased properties. Also, it gives sufficient time for them to publish notary statements and carry on the formal procedures. Informing the target audience by writing lease termination letter is an act of good business practice. You may also see Formal Letters. 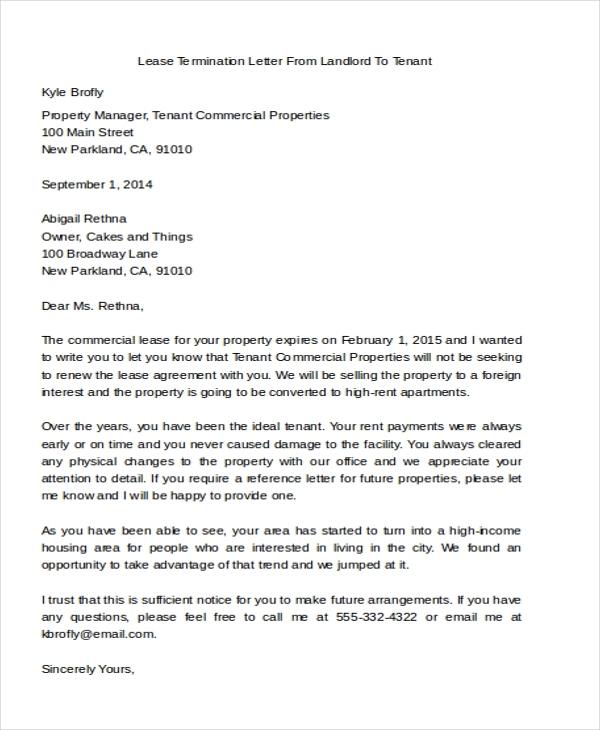 What are The Benefits of Lease Termination Letter? 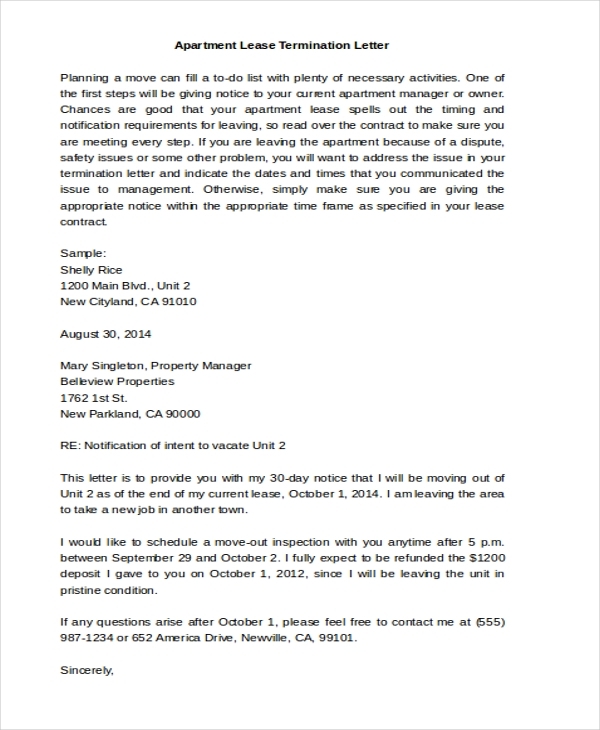 There are a lot of benefits from writing lease termination letter. It helps the tenant and the landlord to take a decision on whether to renew and whether to change the party respectively. It helps in solving any disputes arising between the landlord and the tenant during the time of leaving the leased premises or buildings. It acts as an evidence for informing the landlord so that the risk is passed to the landlord. Also, the landlord can formally take actions against the tenant if he/she has caused any damages to the leased property. It also helps in solving many legal issues. You can also see Recommendation Letters. To conclude, the lease termination letter is written to landlords to inform that the lease agreement has come to an end. There are cases where the landlords write to the tenants to remind them about the termination of the lease agreement. The sample termination letters provide the format and the content to be written. The sample termination letters are general letters and can be referred to write any kind of termination.